1 person was killed and 108 were injured when a New Jersey Transit train crashed full force into the Hoboken station this morning. 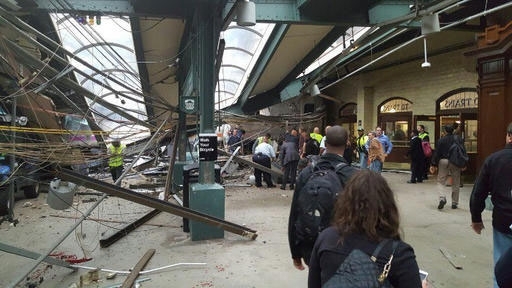 It happened at 8:45 a.m. when train #1614 struck the Hoboken Terminal building on track 5. The train went through the barriers and into the station building itself causing extensive structural damage. The terminal has been evacuated and rail service in and out of Hobocken has been suspended. That includes NJ Transit and PATH trains to NYC. The NTSB will investigate the crash. There were about 250 people on board the train at the time. Watch video from scene just after the crash as people were evacuating the train and station. The Wilmington Fire Department says that a resident of the home on Lakeview Road where two firefighters died in a fire last weekend has been arrested. 28-year-old Beatriz Fana-Ruiz of 1927 Lakeview Road has been charged with two counts of murder in the first degree, four counts of assault in the second degree, one count of arson in the first degree and seven counts of reckless endangering in the first degree. The fire started around 3 a.m. on Saturday, September 24th. Lieutenant Christopher Leach and Senior Firefighter Jerry Fickes were killed in the fire when the first floor collapsed. The assault charges are for Lieutenant John Cawthray, Senior Firefighter Ardythe Hope, Senior Firefighter Terence Tate, and Firefighter Brad Speakman who were injured in the blaze. There is a joint memorial open to the public this Saturday at 1 p.m. at Chase Center on the Riverfront. SEPTA will resume regular service on Regional Rail lines starting Monday, October 3rd. The transit agency says that enough of the repaired Silverliner V trains have returned to operation to support a regular schedule. SEPTA pulled 120 cars out of service over the Fourth of July weekend due to structural issues in the suspension systems. Cars are still being repaired will return to service as they are ready. Delays and overcrowding issues could still be a problem until the full fleet is back. SEPTA will be using the June 19, 2016 schedule. More information can be found here. Eagles quarterback Carson Wentz was named NFC Offensive Player of the Week yesterday and NFL Rookie of the Month today. DT Fletcher Cox won NFC Defensive Player of the Month honors. Phillies at Braves 7:10 p.m.